Abstract : We examine the problem of retrieving high resolution textures of objects observed in multiple videos under small object deformations. In the monocular case, the data redundancy necessary to reconstruct a high-resolution image stems from temporal accumulation. This has been vastly explored and is known as super-resolution. On the other hand, a handful of methods have considered the texture of a static 3D object observed from several cameras, where the data redundancy is obtained through the different viewpoints. We introduce a unified framework to leverage both possibilities for the estimation of a high resolution texture of an object. This framework uniformly deals with any related geometric variability introduced by the acquisition chain or by the evolution over time. To this goal we use 2D warps for all viewpoints and all temporal frames and a linear projection model from texture to image space. Despite its simplicity, the method is able to successfully handle different views over space and time. 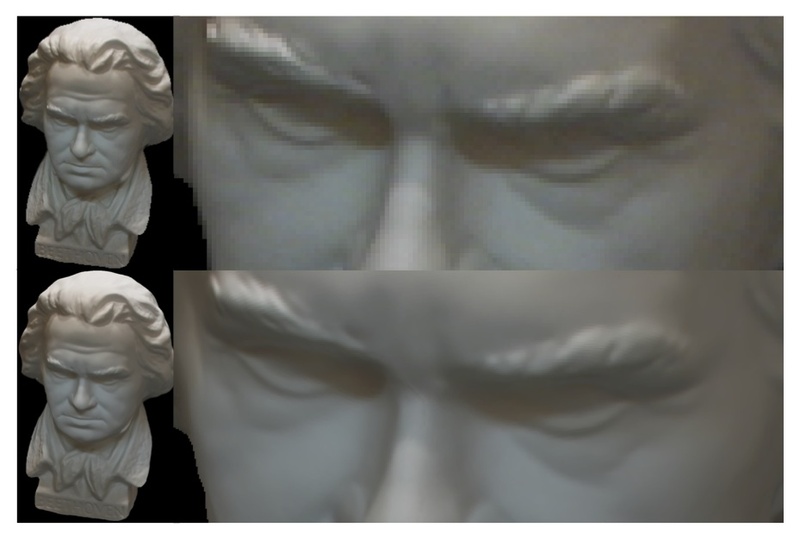 As shown experimentally, it demonstrates the interest of temporal information that improves the texture quality. Additionally, we also show that our method outperforms state of the art multi-view super-resolution methods that exist for the static case.